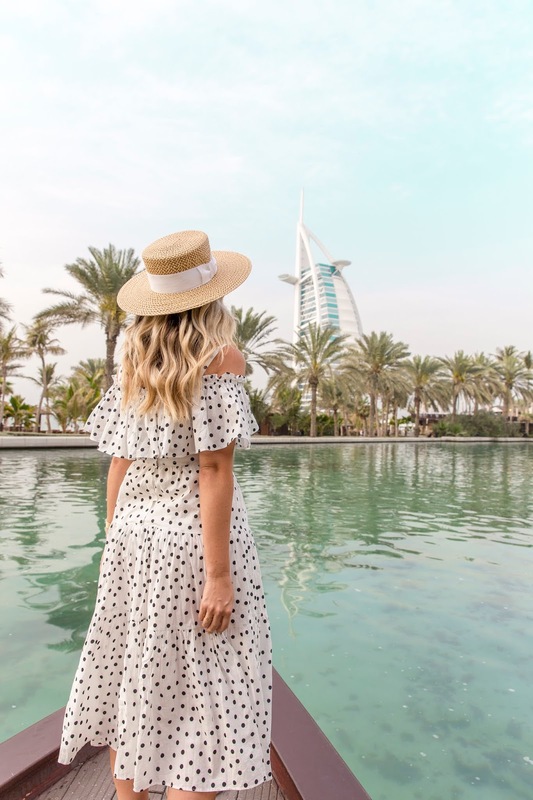 It may have taken a few months, but I’m so pumped to finally share our guide to Dubai on the blog. We had the opportunity to visit Abu Dhabi and Dubai from February to March earlier this year and had an AMAZING time. From the food to the sights and the culture, it completely surpassed our expectations. You can read more about our stay in Abu Dhabi here. I must admit, the flight getting to Dubai wasn’t as horrendous as I had chalked it up to be in my head. We flew with Emirates Airlines (highly recommend!) and a direct flight was just under 13 hours headed there and about 14.5 hours on our way home. We booked economy seats and were pleasantly surprised with the additional leg room, meal options and service in general. If I have the opportunity to travel with the airline again (even at an additional rate), I would not hesitate to do so! Since we knew tackling Abu Dhabi was on our list, we opted for a car rental to cut back on unnecessary cab rides and uber fares. A trip to Abu Dhabi would cost about $250 CAD and we were able to obtain a car rental for slightly more than that so we figured it was a great deal. We found road signs and navigation to be relatively straight forward. Most cars do not come equipped with GPS and cell phone plans in Dubai can be pricey so plan in advance for using your data. 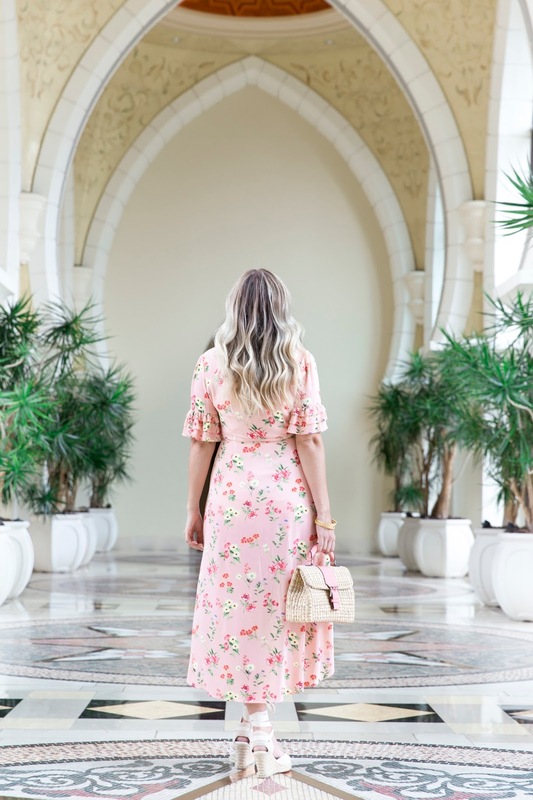 We had the pleasure of staying at the One & Only Royal Mirage during our stay in Dubai. Truth be told, this was my first time staying with a property under the One & Only banner. I had long heard stories of its boutique approach to accommodations and that the customer service was top notch. One & Only actually has three separate hotels within Dubai. 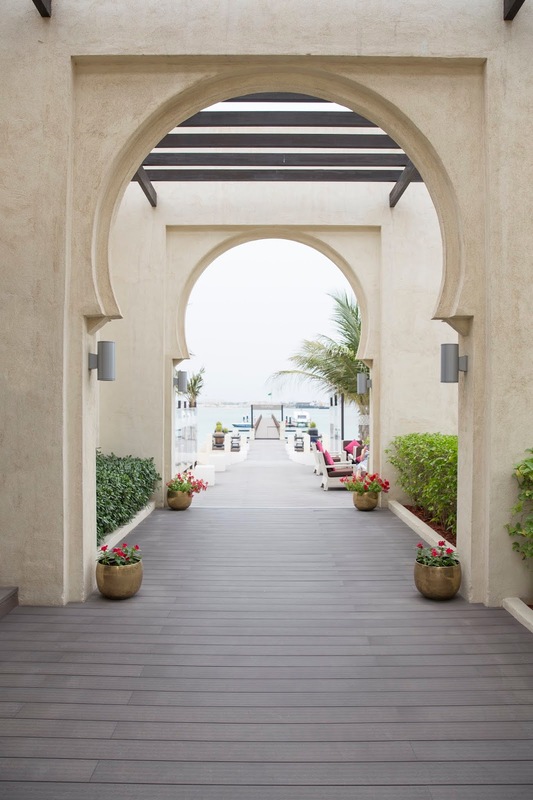 There is One & Only Arabian Court, One & Only Royal Mirage and One & Only The Palm. 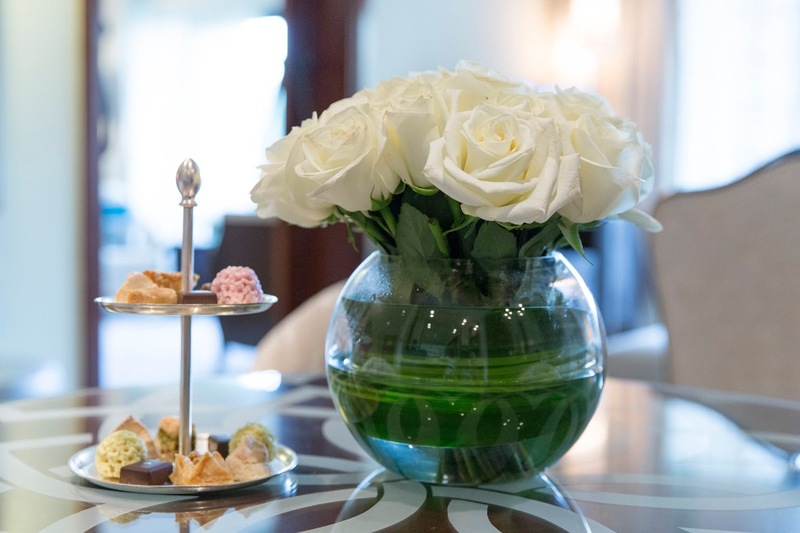 Each offer a unique design and experience for visitors but attention to detail and service were the same throughout. Our hotel was connected to Arabian Court but since the property was so expansive, they had a coach bus shuttle system that constantly ran throughout the property if you didn’t want to walk along the grounds from one end to the other. 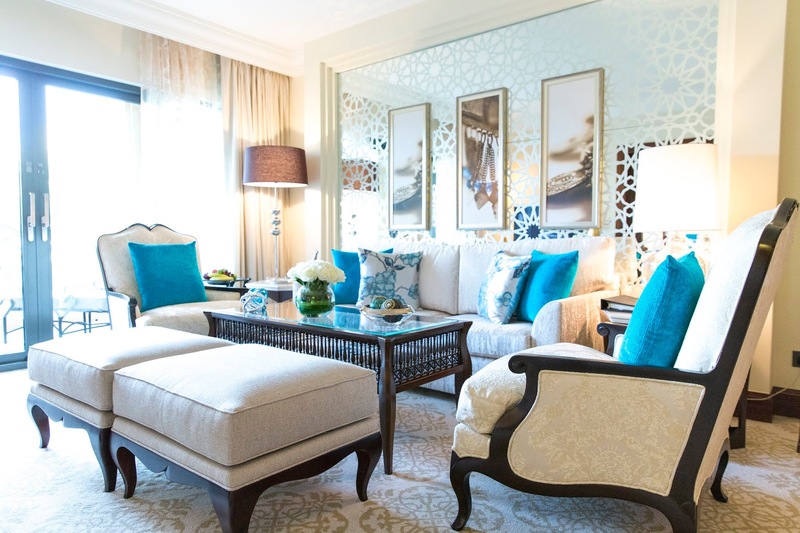 Adorned with Arabesque influence, the initial approach to the property is enough to make your jaw drop. The initial entry into the foyer commands attention with a mosaic ceiling is covered in gold details. I couldn’t get over the sprawling grounds on the property and the gardens were absolutely stunning to stroll around. And don’t get me started on the beach! 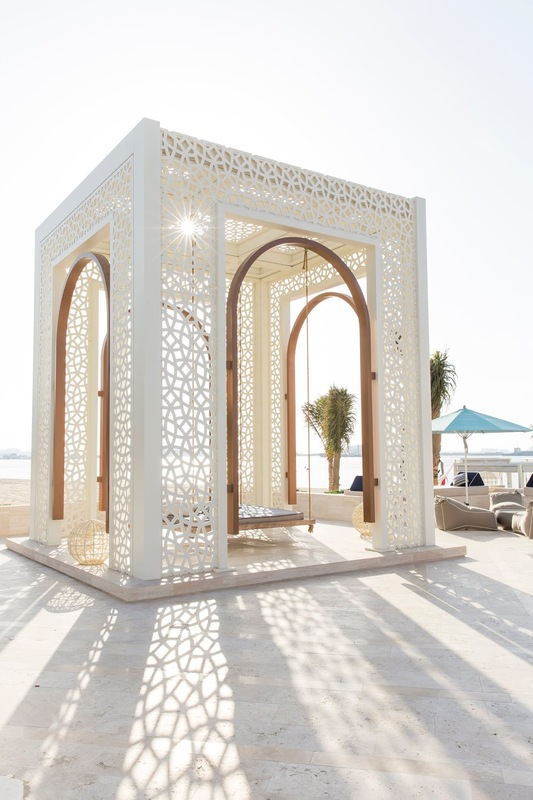 The parasols over each set of beach chairs made for the most picture-perfect backdrop. 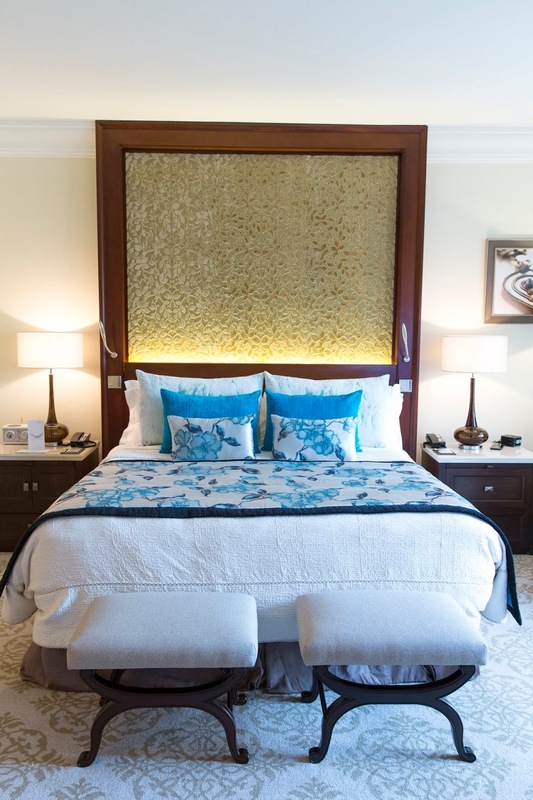 We had the pleasure of staying in an Executive Suite Bedroom, and One & Only isn’t playing around when it comes to suites. From a double door closet, desk area, dining nook, living room and double doors to our own bedroom, the first impression was naturally, “Oh my word.” The room even included a his and her wardrobe closets. The bathroom was insanely oversized with a stand-up shower, soaker tub and double sinks. Last but not least, the balcony view of the property and beach made for an amazing way to wind down after a day sightseeing or at the beach. 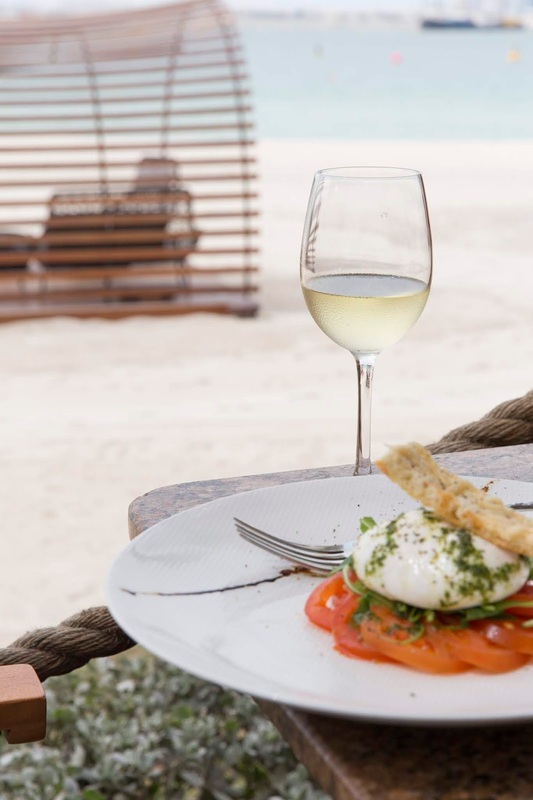 Whether it’s soaking up the sun at DRIFT beach, enjoying water sports or even paying a visit to the spa, there’s plenty to do on site. 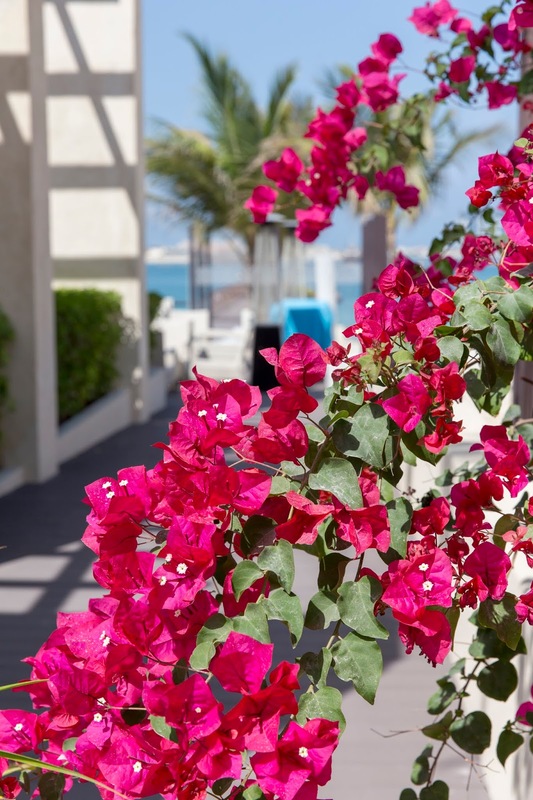 I had the pleasure of enjoying a Traditional Hammam experience at the One & Only spa. I had passed up this opportunity in Morocco and wanted to take advantage while I could. I must say, this spa might go down as one the prettiest and most serene I’ve ever seen. And the treatment certainly was an experience. From the massage to the cleansing of the skin, I felt like a new woman. Beware though – I recommend one of these treatments before you hit the beach and not after you tan your skin! 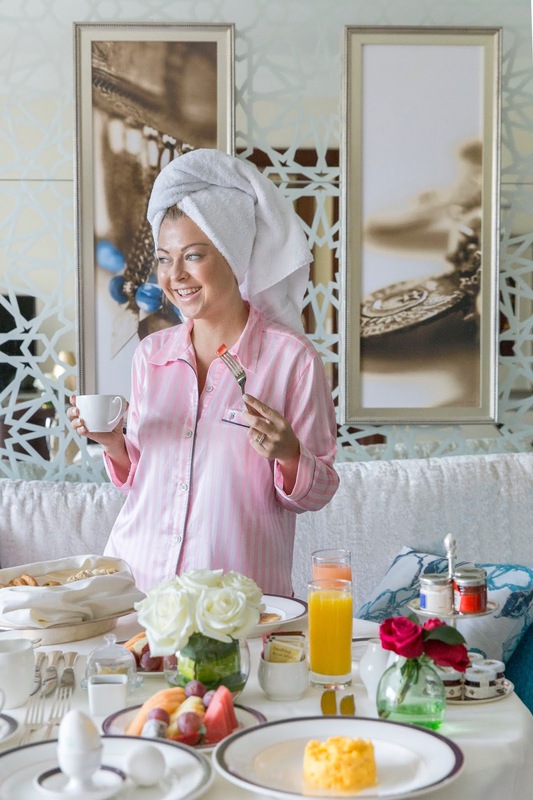 Whether you’re staying on the property or not, a visit to Celebrities for breakfast is a MUST DO if you’re visiting Dubai. I have ever seen a more extensive daily buffet in my life. Whether it was 10 fresh squeezed juice options to 12 jams or every fruit you could imagine possible – the buffet had it all. The menu was extensive, and their cappuccinos were to-die-for. 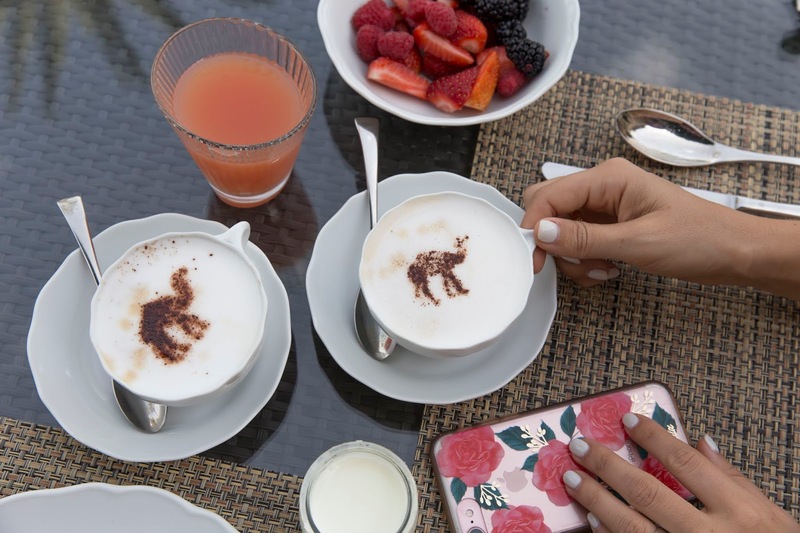 I also adored that they came with camel art every morning! Tagine was another great option for Moroccan fare on site – their tagine was great, and the live music was a perfect touch. Eauzone offered Asian cuisine and dining amongst water canals made for such a romantic spot. Another must do is sunset cocktails at The Jetty Lounge. 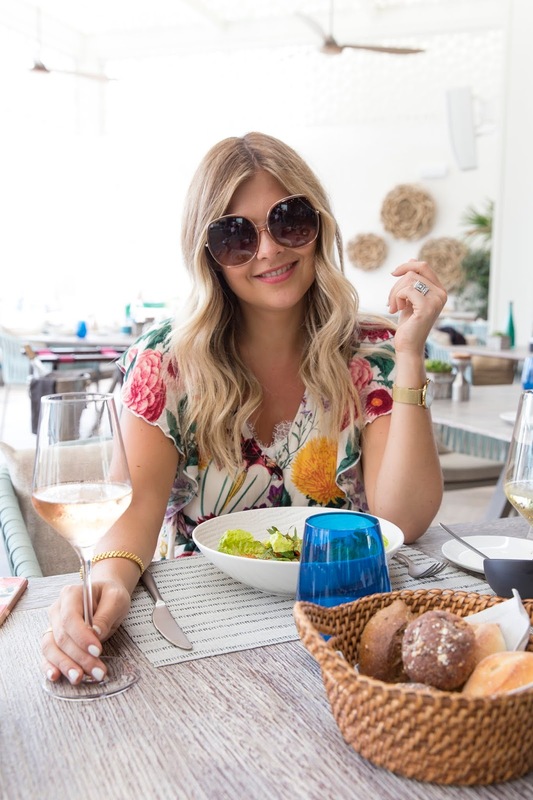 I loved enjoying a glass of rose, apps to snack on and an overall great vibe as we watched the sunset over The Palm. 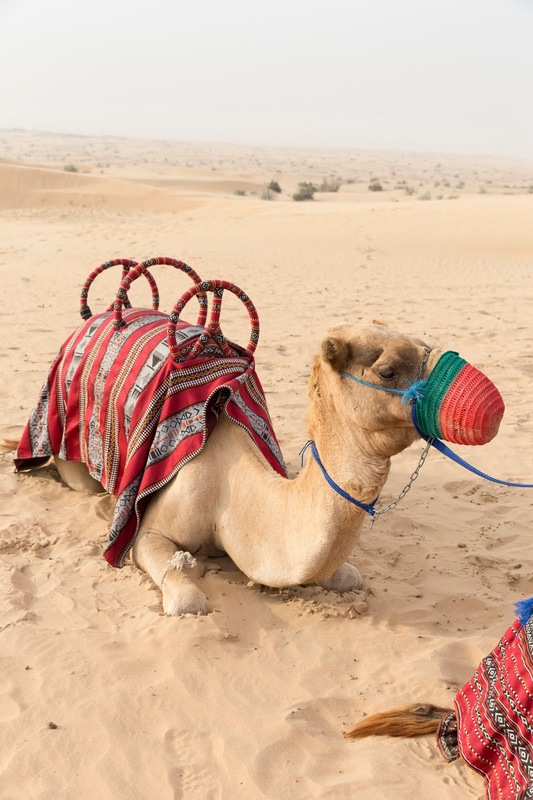 A Camel Ride: Cliché, yes but you can’t go to Dubai and not experience this. We missed our chance in Morocco and agreed a sunset tour would be on our bucket list. We used Ocean Air Travels and were super impressed with the entire experience. The photo options at sunset are gorgeous and getting to soak up the Arabian Desert at dusk is such a serene experience. I do recommend packing a blanket for the evening and a second for under your bum – the ride isn’t the smoothest! 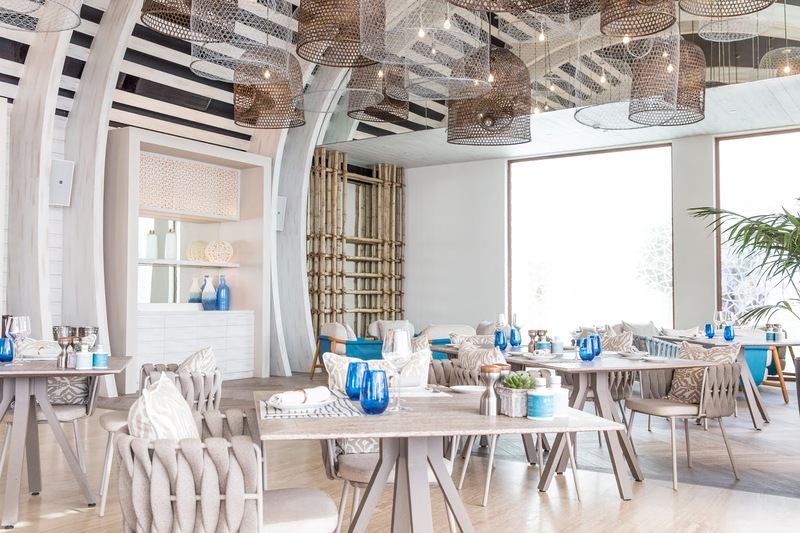 each Club: Forget the sightseeing, shopping and anything else you’ve got planned and be sure to plan an afternoon at DRIFT beach club. 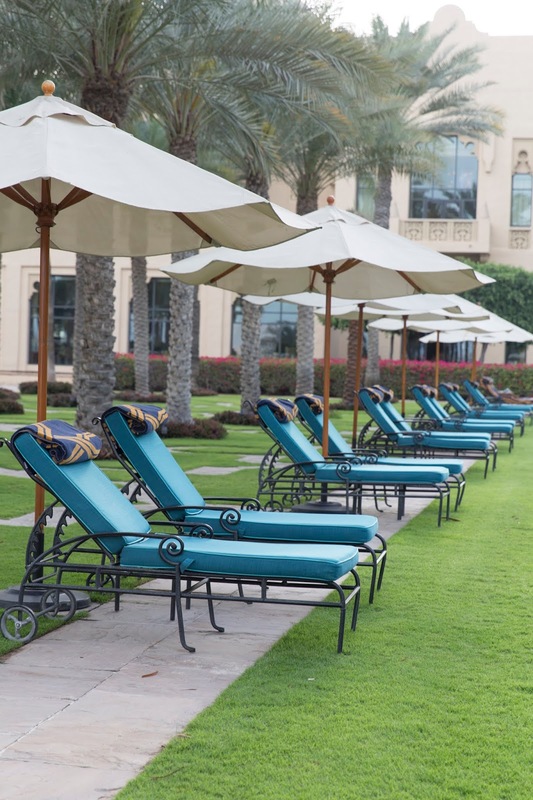 From loungers on the beach to poolside swings, we had a blast soaking up the sun here for an afternoon. 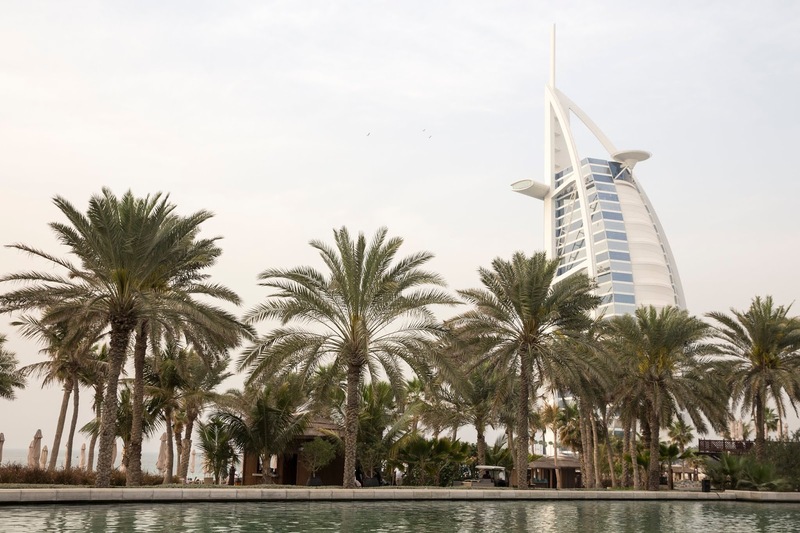 Madinat Jumeirah Abra Tour: Tour the town by boat and catch sights of the Burj Al Arab and the Madinat Jumeirah property on a traditional Abra. Another great option for capturing an Instagram-worthy snap! Be sure to visit the modern souk here too. City Walk: We loved strolling around City Walk around dusk or after dinner. From coffee shops to ice cream parlours and more, there’s so much happening that it’s a must do spot. Malls: Nobody does shopping like the UAE. 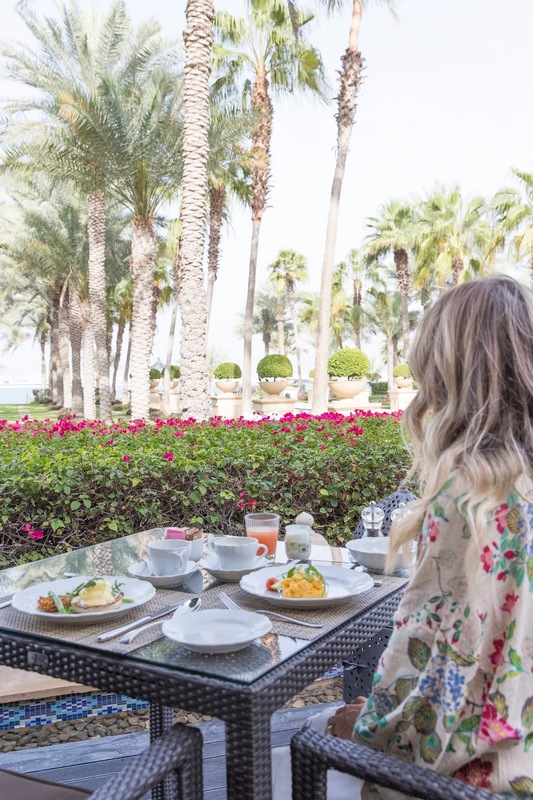 Whether it’s the Dubai Mall or the Mall of the Emirates, no visit would be complete without a stop into one of these spots. From hair salons to aquariums and restaurants and even ice skating rinks, there’s literally a ton to see and do. For my shoe lovers, you must visit Level Shoes in the Dubai Mall – you’ve never seen anything like it! Dubai Fountain: Head to the Dubai Mall one evening and be sure to visit one of the timed fountain shows in front of the Burj Khalifa. Tip! Head to the Apple store and score an unobstructed view from their balcony. 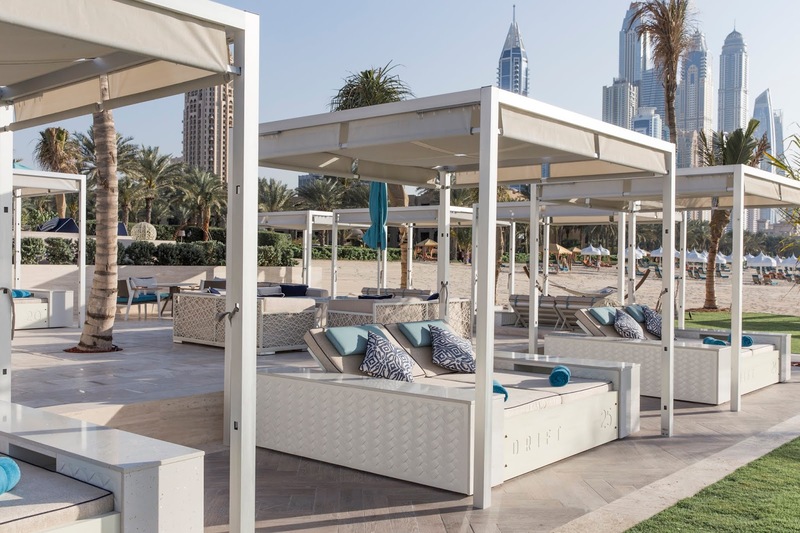 Jumeirah Beach: A great public beach with views of the Palm and Burj Al Arab. 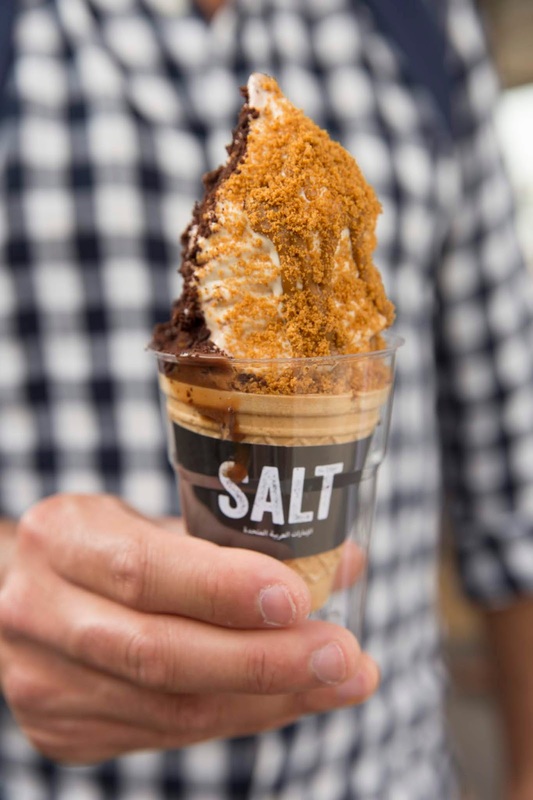 You MUST pay a visit to SALT burgers if you’re there for the afternoon. Stroll along the boardwalk and feast your eyes on all the food trucks and tuk -tuks parked beachside. Miracle Garden: A sight for sore eyes, the Miracle Garden is a dream. 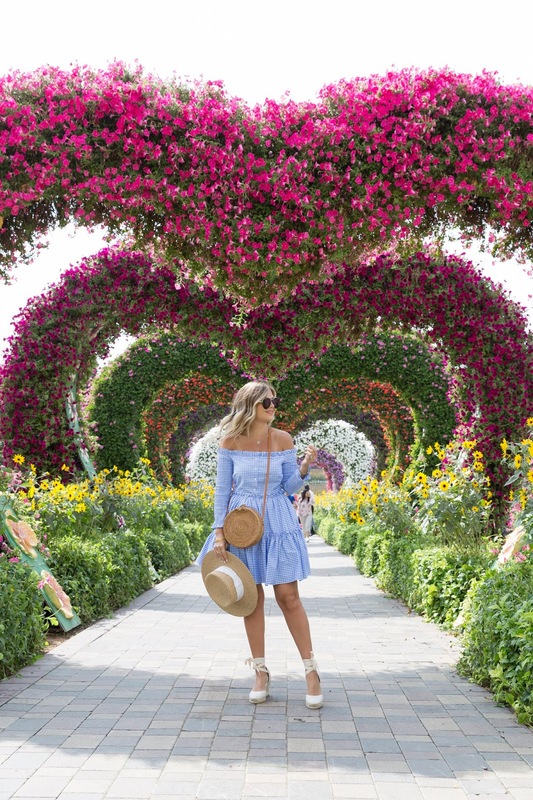 With floral installations throughout, you’ll definitely want to bring your camera to snap a few (thousand) photos of the sights. Pack your patience if you’re hoping to snap a shot in the heart archway. Mythos: So many friends had raved about the Greek food at this place and they were bang on. Highly recommend for authentic cuisine (the owner is an ex Pat) and a cute ambiance. 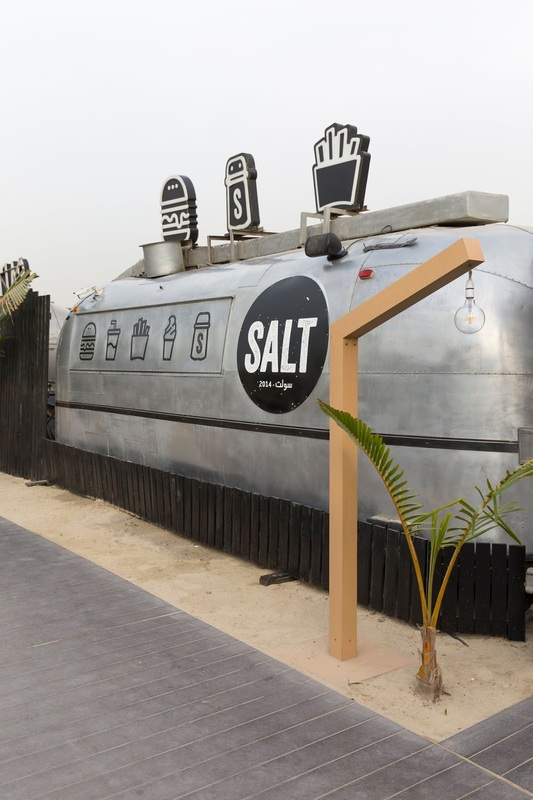 SALT: If you make your way to Jumeirah Beach, follow the boardwalk until you get to SALT burgers. They were oh so tasty with a side order of fries. Don’t forget an ice cream to go! Ting Irie: You wouldn’t necessarily associate Caribbean cuisine with the UAE, but their Curry Goat and Fried Chicken were amazing! Flamingo Room: Another insta-worthy spot, we dropped by for cocktails one afternoon but instantly regretted we didn’t stick around for a late lunch or dinner based on the fare we saw headed out from the kitchen. Operation Falafel: A great lunch spot that we stumbled upon one day before heading to the beach! Matto: A simple approach to Italian that was oh-so good! The atmosphere was relaxed and super casual. We loved their wood burning oven pizza! 101 Dining and Lounge Bar: A MUST! Make a reservation at this restaurant on the Palm for stunning views of Dubai from the water. Bust out your best #OOTD when it comes to this spot and crowd! 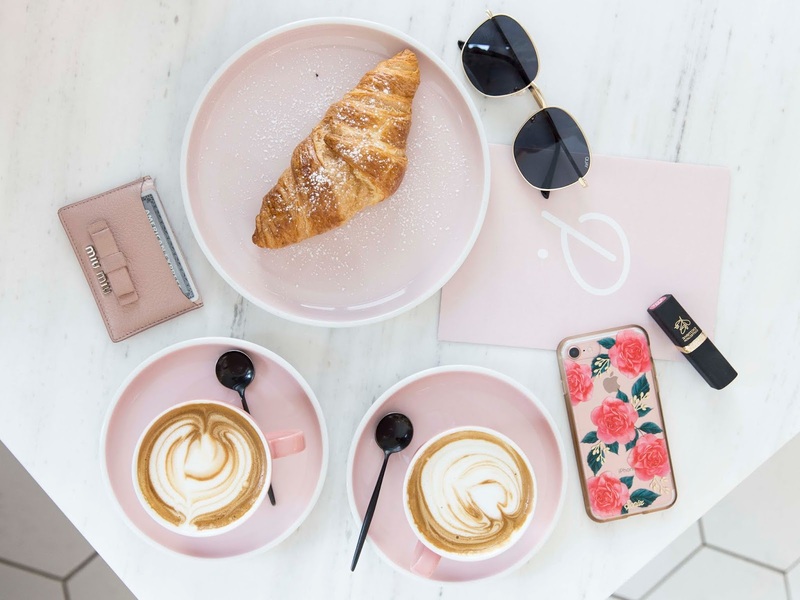 Parlour Café: For all my pink lovers, this café is a must do. A little off the beaten path but they sure do make up for it with killer cappuccinos and the cutest serving dishes. Angelina: An upscale tea-room that resembles the likes of L’aduree, it was too cute to pass up! Mitts & Trays: An uber cute café with brunch options. 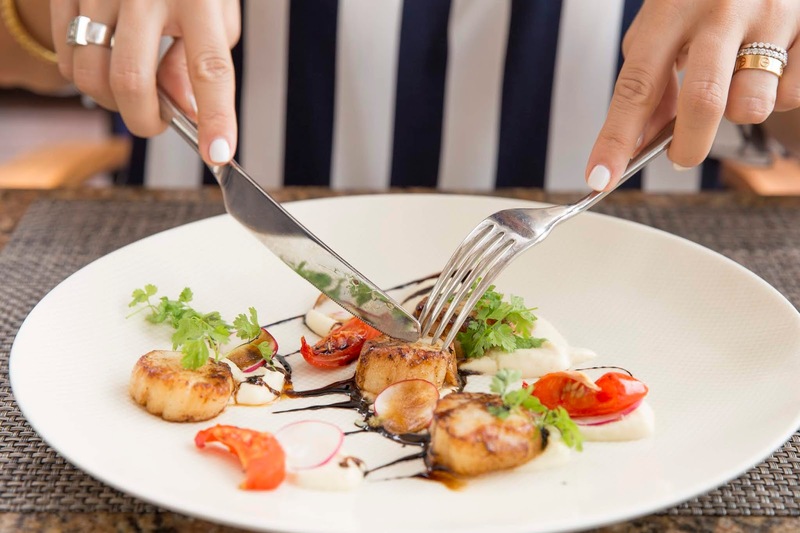 It’s located in City Walk and close to the malls and all the happenings for a quick bite. Skyview Bar: We saved the best for last and opted for a cocktail at the Skyview Bar on our last night. 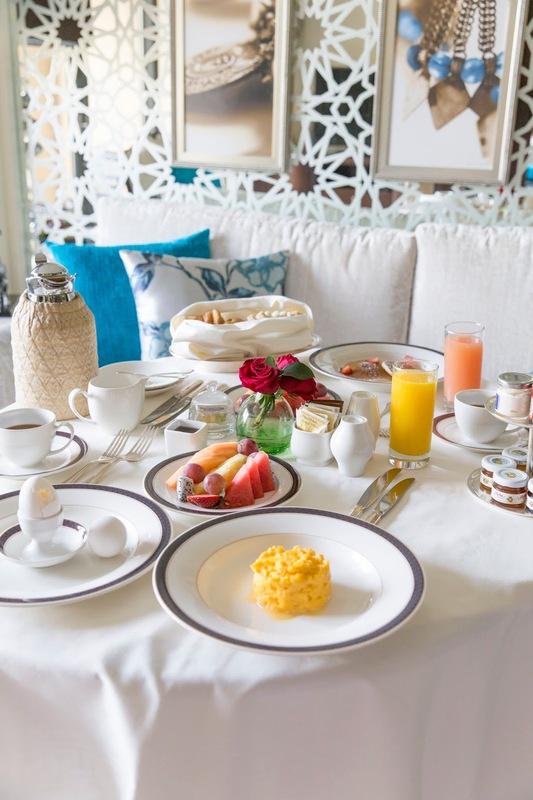 Located at the top of the Burj Al Arab building, make a reservation in advance of your visit if you’re looking for a table by the window. Truth be told, the cocktails were pricier than we had bargained for, but the view helped ease the sticker shock when they delivered the check. On our list but we never made it: Café Des Artistes, The Brass Coffee & Community, Falla, Maison Mathis, L’ETO and Farzi Café. Video edited by Cameron Street Photography. loved all the info and pictures. you are awesome. Thanks for sharing Dubai Travel guide, Yes, it’s artificial, over-the-top and a bit strange to see such a modern, air-conditioned city in the middle of the desert. All the pictures look amazing. I went to Dubai last year and had to get my Express Dubai Visa done. Hey Lovely post! My husband & I love to travel. We spend our holidays always on our favorite destination place. Then I found your post & can't resist my self to book my dubai visas uk. I just love your post. Wow! Such an amazing and helpful post this is Top View Sightseeing coupons 2019. I really really love it. It's so good and so awesome. I am just amazed.